Rockfire Sundance (Macca) is a registered Welsh C (welsh pony of cob type), 20yo mare, approx 13.1hh. Macca has had a great life, she has had 3 foals, has been successfully shown in breed and hunter classes, has had extensive dressage training and the most amazing extended trot, has attended pony club and excelled at sporting, she has spent time looking after weanlings and has had times when she has simply been a paddock pony. We are looking for a new home for Macca as she reacts to the excessive amount of mosquitoes that we have here and we would like her to be more comfortable. With her years of experience and training Macca would make the ideal schoolmaster for a small rider (child or adult) to progress through the grades. 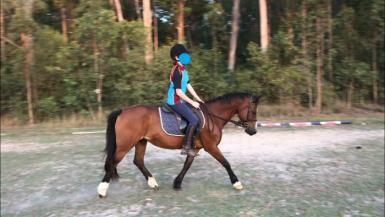 She will not suit a beginner or nervous rider as she is forward and has a lot of buttons! She has a soft mouth, responsive to leg and seat aids and tries to please. She is a sweet pony who thrives off being worked and it’s a shame to see her wasting in the paddock. She is a very enjoyable and uncomplicated ride for a competent rider. She will not suit sporting or mounted games. 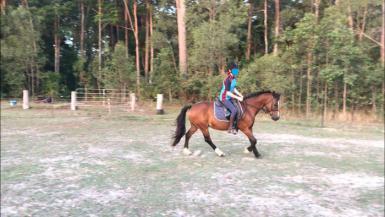 She is still cycling and would be able to continue as a broodmare, very easy breeder and is a great mother. Macca would also be a good companion pony and is great at nannying our weanlings. Great to float and to do feet – she is barefoot. Lives in the paddock with youngstock, ponies and horses. No health problems other than reacting to the mosquitoes. Asking $500, this does not represent her value but our desire to see her being used and to move her to an environment where she is more comfortable - one that has less mosquitoes.